The final pages of the Minor Family Album hold photographs of children, none are identified, one looks familiar. Together they present a plate of youthful Victorian fashion from the closing decades of the 19th century. Separately they tell stories, even as the personalities remain cloaked in anonymity. I hope you will return to this space as I reveal the hidden meaning of a photographer’s imprint and point out clothing clues that help family historians “age” the subject. Play a game of “I Spy” as you examine the portrait for the photographer’s equipment or count the ribbons on a toddler’s velvet dress. I look forward to hearing your reactions in the coming weeks. Florence McClure Titus, Thomas W. Rogers, photographer, Carmichaels, Pennsylvania, about 1892. The Minor Family Album, page 22: Author’s Collection. In the mid to late 1800s entire branches of original Greene County, Pennsylvania families headed west. Some may have stopped in Ohio or Missouri before finally heading west again–to the fertile lands of Iowa. Stephensons, Minors, Hartleys, and Keenans swept into the plains of Taylor County, along the south-central border with Missouri. And many of these western pioneers were related to my great-great-grandfolk, Marion and Mary Jane Minor. The Minor Family Album, then, is more than a photograph storage container; it is the recording of our country’s western migration, and its impact on this extended family. Page eleven, for instance, tells the story of Jesse Minor (1853-1926) and his wife, Olive Independence Sims (1860-1909). Jesse grew up next door to Marion and Mary Jane, the son of Marion’s brother, Samuel. The young farmer left the Minor-studded hills of Ceylon Road when he was just twenty-three, found a wife in Missouri, and settled on land just south of Mormontown (Blockton), Taylor County, Iowa. At the time of this portrait, Jesse and Olive were tightly integrated into the agrarian communities by faith, farming, and family. Cousin John P. Keenan farmed acres just north of Jesse, and brother John P. Minor lived just to the south. To the east, just over the Ringgold County line, lived Keenan’s sister, Hannah Hartley, and Minor cousin, John and Mary Stephenson. Jesse is shown in this photo sitting in the only chair, a Victorian reference to his status as head of household, and his son, Joseph Carl “Jed”, is balanced on his dad’s crossed legs. Olive sits primly to Jesse’s side, her hands folded in her lap. Their tween daughter, Della May, stands beside her mother, her hand draped on her father’s chair. The group is well dressed, facing the camera with confident, happy eyes. Fourteen years after leaving southwestern Pennsylvania, little Jesse Minor has firmly established himself as a successful farmer, stock buyer, husband, father, and community member. This image captured his contentment and pride more completely than any letter’s words, and was saved, ever a reminder that family ties endure, even if Taylor is the new Greene. Victorian Lady of Ringgold County, Iowa, taken by Matthew G. Maxwell, between 1888-1892. Victorian Man of Ringgold County, Iowa, taken by Matthew G. Maxwell between 1888-1892. I am becoming a bit wary of this great-great-grandmother of mine, Mary Jane Minor. She does not appear to have had much of a design plan for this photograph album, for turning to pages six and seven, I am greeted by strangers once again. Strangers from Iowa. The man sports a full beard and moustache, and wears his plaid coat unbuttoned to show off the matching vest and watch chain. He appears to be in his mid-late forties. The woman looks to be about ten years his junior and wears her hair parted in the middle with no bangs and severely swept back to the nape of her neck. Her dress is made of a dark cloth, the tightly fitted bodice decorated with ornate embroidery trim on either side of the column of buttons and a bit of lace peeking out at the throat. The puffed shoulders of her slim sleeves are my best hint that this photograph was taken sometime between 1888 and 1893, when women’s fashion dictated ever fuller leg of mutton sleeves. Before 1888, the sleeve would have been sewn flat at the shoulder. The photographer was Matthew G. Maxwell who first learned his trade while working for Mr. Goldsberry of Bedford,Taylor County, Iowa. By the time of these portraits, Mr. Maxwell had an established studio in Mt. Ayr, in the neighboring county of Ringgold. Neither of these two folks are Mary Jane’s children, all of whom can be accounted for back east. John P Minor (Jr.) was married with a child, and living right down the road from Mary Jane and Marion. Sarah Minor Herrington was a widow, with a child, and living nearby. Olfred had died in 1886, and his widow and children were being cared for locally by Mary Jane and Marion. And Robert, my grandfather, was still living at the home farm on Ceylon Road with his parents. Time to shake the family branches! A few candidates fall out during the search for middle aged relatives living in or near Mt. Ayr, Ringgold County, Iowa in the late 1880s. John Minor Stephenson was Mary Jane’s nephew, as his mother, Hannah, was Marion Minor’s sister. John had moved to a farm near the village of Maloy in Ringgold County with his wife, Mary Dulaney, in 1867. In 1888, John would have been 54 and Mary would have been 44. 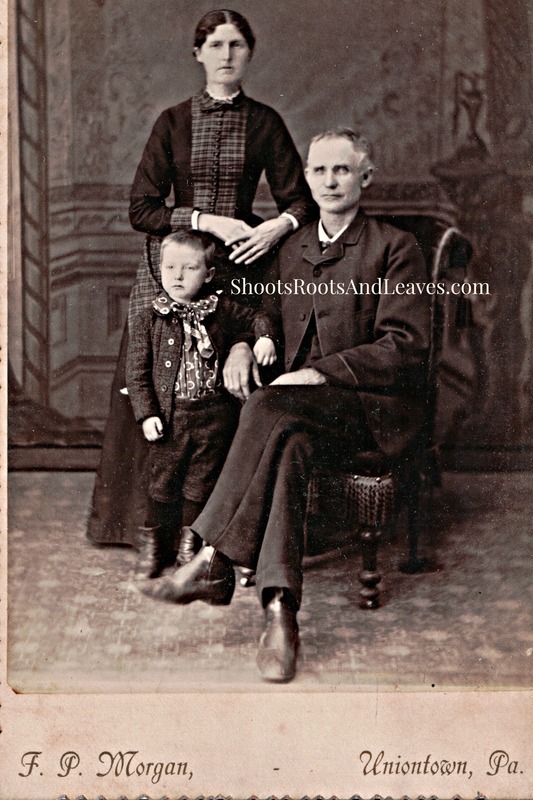 If Iowa fashion lagged trends, and the photographs were actually taken in the early 1890s, then John would have been in his late fifties and Mary in her late forties. John P. Keenan was another nephew, son of Isabelle Minor Keenan. John went to Taylor County, Iowa in the 1870s, and for several years herded cattle before purchasing land of his own in neighboring Ringgold County. He married Minnie and eventually went back to Taylor County farming land close to the town of Blockton. In the late 1880s John P. would have been in his early thirties, and his wife Minnie in her early twenties. John Keenan’s sister was also in Taylor County, Iowa. Hannah and her husband, John Milton Hartley relocated from Greene County, Pennsylvania to Iowa in 1874. The two raised their family on a Taylor County farm before starting a business in the town of Maloy, Ringgold County, Iowa. In 1888, Hannah would have been 35 years old and husband John would have been 48. Two other Greene County boys had settled in Taylor County, Iowa by the late 1880s, Jesse and John P. Minor, sons of Marion’s brother–and next door neighbor–Samuel. They and their wives held contiguous farms just south of the town of Blockton. Jesse would have been in his late thirties and Olive in her late twenties. John P. and Mary Ellen would have been in their late twenties. Let’s suppose at the time of the portrait session, the residences of all these Minor kids were within traveling distance of Matthew G. Maxwell’s studio in Mt. Ayr. Jesse and John P. Minor were too young to be the gentleman shown. Furthermore, I have comparison portraits of these guys which confirm that Mr. Page Seven is not a picture of them! John Stevenson would have been much older than the man in this photograph. John and Minnie Keenan would have been much younger than the two pictured here. The most likely identity of this couple–with what I know now–is Hannah Keenen Hartley and her husband John Milton. I will have to keep an open mind as I continue this puzzle, matching up letters and documents with what clues I have in photographs. But for the moment…I think have added one more stranger to my family tree. Well, THAT sense of satisfaction was short-lived!!! Dare to compare. Hannah Hartley appears to have a bigger frame and a broader nose than my Victorian lady. And John Milton Hartley appears to be bald, whereas my dude is thinning at the temple. I must return these faces to the stranger pile, to be hung on my family tree at some future date.